Tuesday, July 12 — James Miyashiro, Senior Director of Safety Operations, University of LaVerne (LaVerne, Calif.): Public forums include a student session from 11-11:50 a.m., a public presentation and Q & A from 2:30-3:30 p.m. open to all, followed by a session for faculty and staff from 3:40-4:25 p.m., all in Susan Campbell Hall Room 111. Dear University of Oregon Representative: My interest in the position of Chief of Police for the University of Oregon is based on my continued desire to serve at institutions of higher education. The University of Oregon has always been one of my top choices of educational institutions, because of the universities quality academics, rich student life, attractive facilities and strong name recognition. I currently have over thirty years of law enforcement experience dealing with service oriented municipal, university, college and school district police agencies. Friday, July 15 — Matthew Carmichael, Chief of Police, University of California, Davis: Public forums include a student session from 11-11:50 a.m., a public presentation and Q & A from 2:30-3:30 p.m. open to all, followed by a session for faculty and staff from 3:40-4:25 p.m., all in the Knight Library Browsing Room. Dear Ms. Jouban, It is with great excitement that I submit my application to you for the position of Police Chief at the University of Oregon. I learned of this vacancy through an online job search engine, Indeed.com. I am interested in this position for several reasons. First, the University of Oregon is an amazing institution and a community I would like to be a part of. Second, the Eugene area is a place my family and I would like to call home. If considered for this position I would look to live as close as possible to campus. My family has enjoyed spending time on my current campus and knowing the University of Oregon I am confident we will find ourselves more often than not on campus. Lastly, the University of Oregon Police Department is a relatively new organization and I am excited about the opportunity to help ensure the police department is as cutting edge as the community it serves. Monday, July 25 — “Candidate C“: Public forums include a student session from 11-11:50 a.m., a public presentation and Q & A from 2:30-3:30 p.m. open to all, followed by a session for faculty and staff from 3:40-4:25 p.m., all in the Knight Library Browsing Room. Candidate name and materials to be published here July 21. His excellent summary is in the Emerald, here. 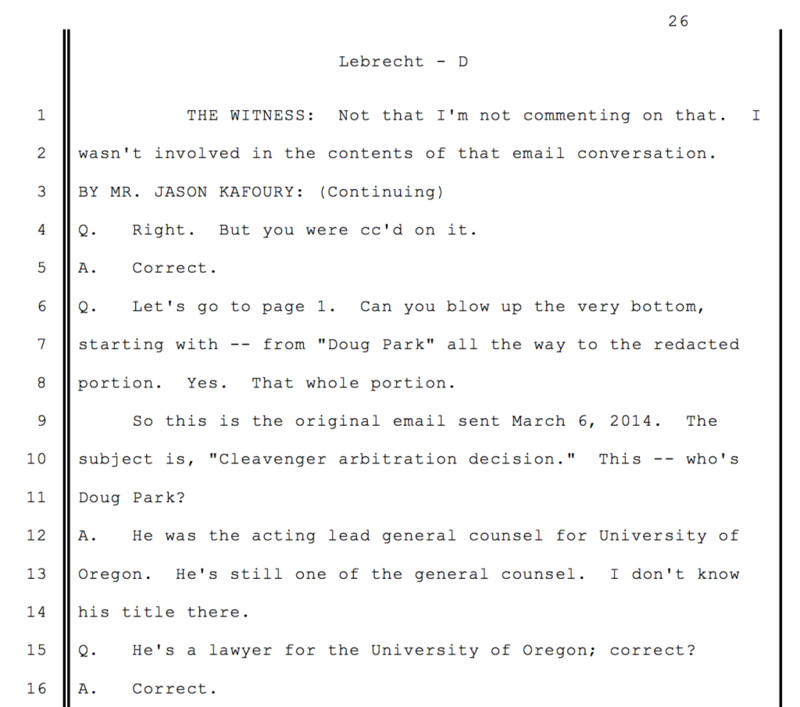 Some good quotes from a former officer and the usual pablum from the UO administration. All worth reading. The VPFA has responsibility for managing the UOPD (previously known as Public Safety). The VPFA was initially France Dyke, then in 2012 or so, after a failed external search, Lariviere promoted Jamie Moffitt to VPFA. Moffitt had been on the search committee, which raised some potential COI questions about her promotion. Her previous job had been managing Duck athletic finances. During the Cleavenger debacle Schill moved UOPD oversight from Moffitt to Andre Le Duc in Risk Management, who reports to Moffitt. The University of Cincinnati has agreed to pay $4.85 million to the family of an unarmed black man who was shot to death in July by one of its police officers, a settlement that also requires the college to provide an undergraduate education to his 12 children, create a memorial to him on campus and include his family in discussions on police reform. … Mr. DuBose, 43, was shot and killed on July 19 by Officer Ray Tensing, who pulled him over in a Cincinnati neighborhood adjacent to the campus because his car lacked a front license plate. The shooting was captured on a body camera, and Officer Tensing, who was fired from the department, faces trial on a charge of murder. Here at UO, there’s still no formal announcement of when UOPD Chief McDermed will be replaced by new Assistant Chief of Police Chou Her. Presumably UO is delaying the announcement so as not to damage its efforts to convince the judge in the Bowl of Dicks trial to cancel the jury’s $755K award to former UOPD officer James Cleavenger. That hearing is Feb 12th. Mr. DuBose is not the first black man to die as a result of an encounter with the University of Cincinnati police, and he will not be the first to have a memorial on campus. Kelly Brinson, 45, a psychiatric patient, and Everette Howard, 18, a student, died in 2010 and 2011 after campus officers fired stun guns at them, according to lawsuits filed by their families. Of course campus police can be victims of shootings as well as perpetrators. It’s not clear if armed police are safer, even for themselves. One particularly sad story comes from the University of Central Florida, where a university cop was shot and killed by another officer, who was trying to control drinking at football game tailgate parties. The green-shirted man with the gun is an undercover UCF police officer, pointing his pistol at a drunk UCF student. The student apparently grabbed the gun, it went off, and a uniformed police officer who hadn’t been told of the operation then shot and killed the undercover officer. What happened to Richard Turkiewicz, the UCF police chief who set up this botched operation? 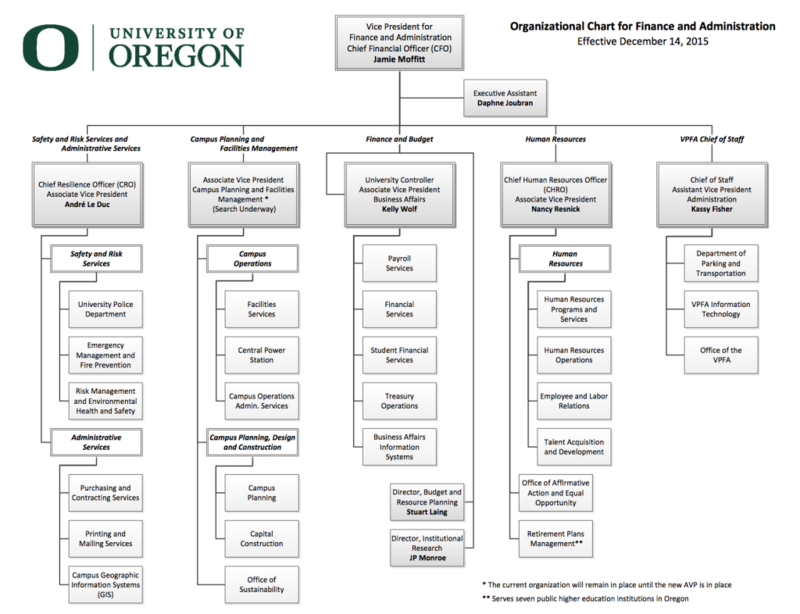 Frances Dyke, former UO VPFA, hired him as UO’s interim Director of Public Safety. No kidding. Dyke then went on to persuade the Oregon legislature to allow UO to set up its own armed police force. 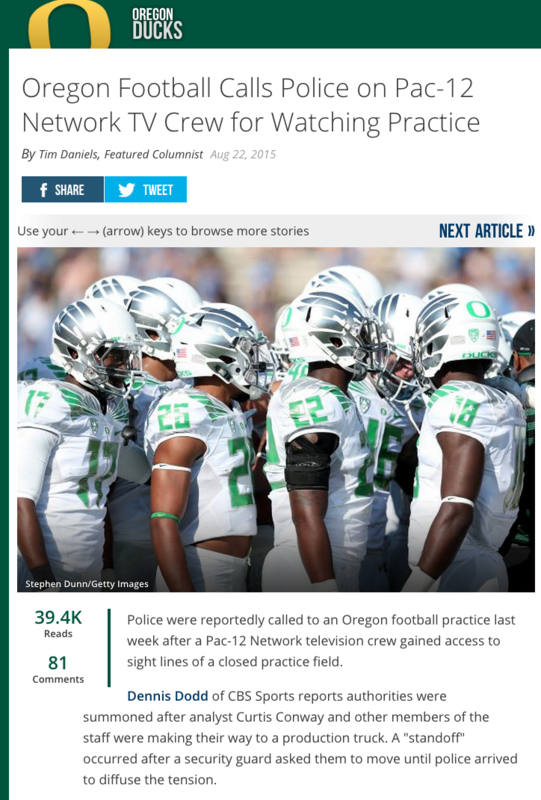 What sort of oversight does UO have for its police? 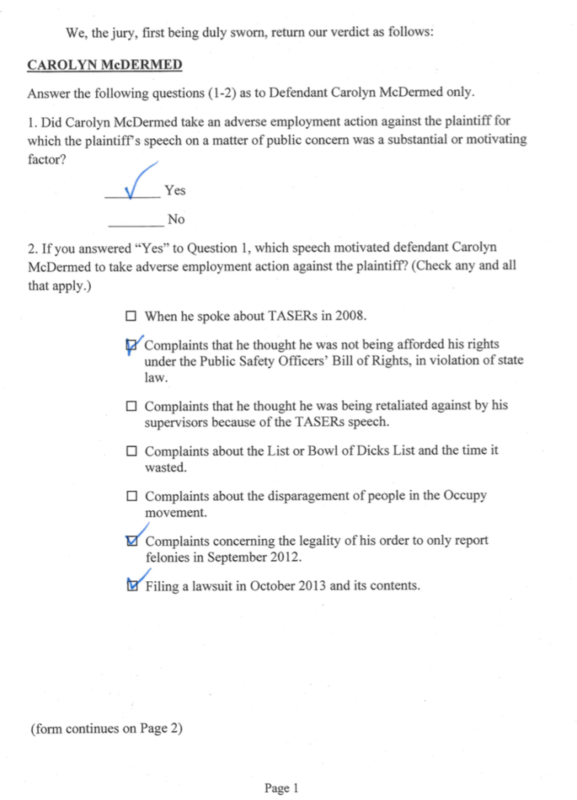 … UO also has its own attorney fees. 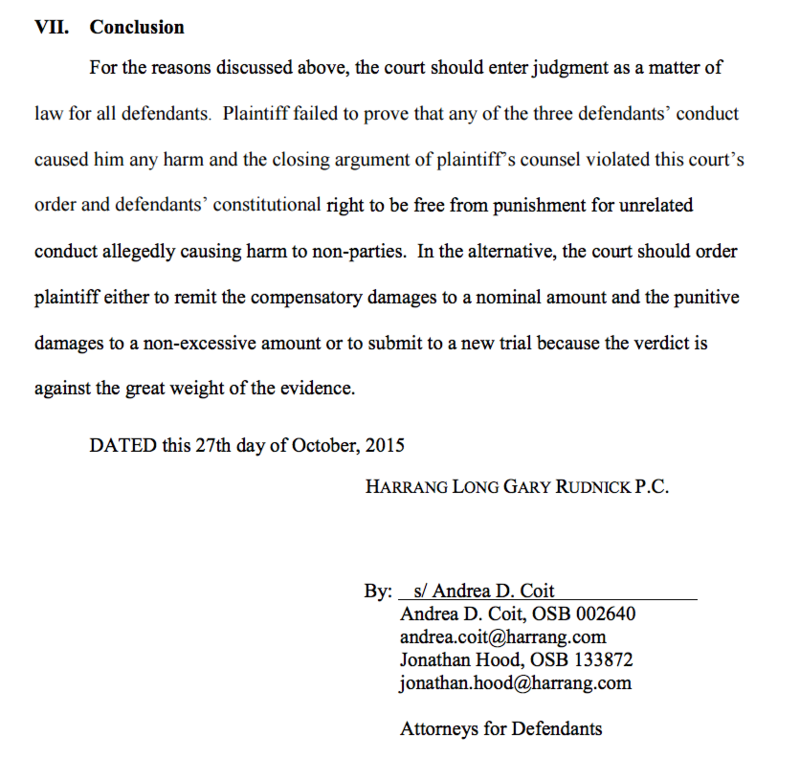 UO was represented by Eugene firm Harrang, Long, Gary and Rudnick. 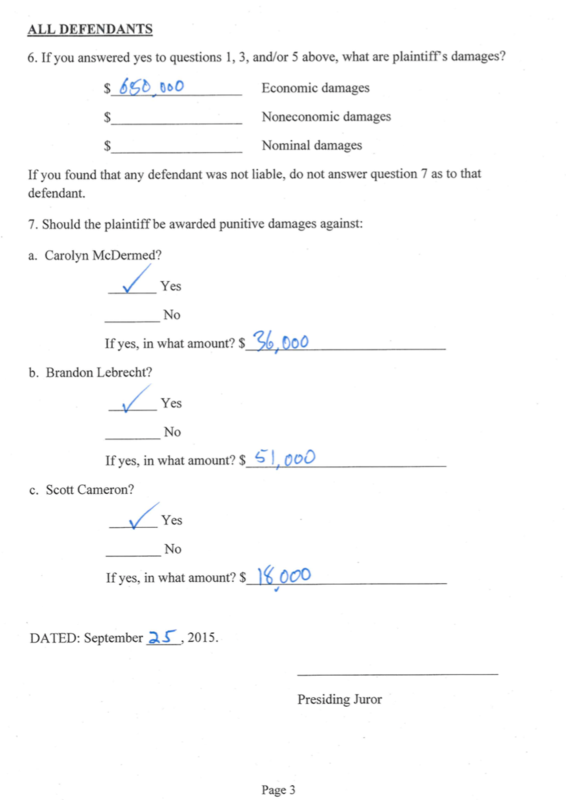 The total of all their approved fees is $394,925.70, according to the Office of the General Counsel. The university’s insurance policy has so far paid $281,867 to Harrang, Long, Gary and Rudnick. UO has an insurance policy that will pay all $1.6 million. The Public Universities Risk Management and Insurance Trust, PURMIT, covers the seven public universities in Oregon. From what I can figure out PURMIT is a risk-sharing pool for Oregon’s seven public universities, with outside reinsurance for losses beyond some threshold. Which means that it is very likely that the costs of this case, and the Jane Doe lawsuit, and the James Fox settlement, etc., etc., are not being “paid by the insurance company” but instead are being spread out among UO, OSU, PSU, WOU, SOU, EOU, and OIT. Assuming the sharing is in proportion to budgets, this means UO is paying about 1/3 and the Beavers are covering about 1/3. I’m no lawyer, but I’m thinking this is so not going to happen. 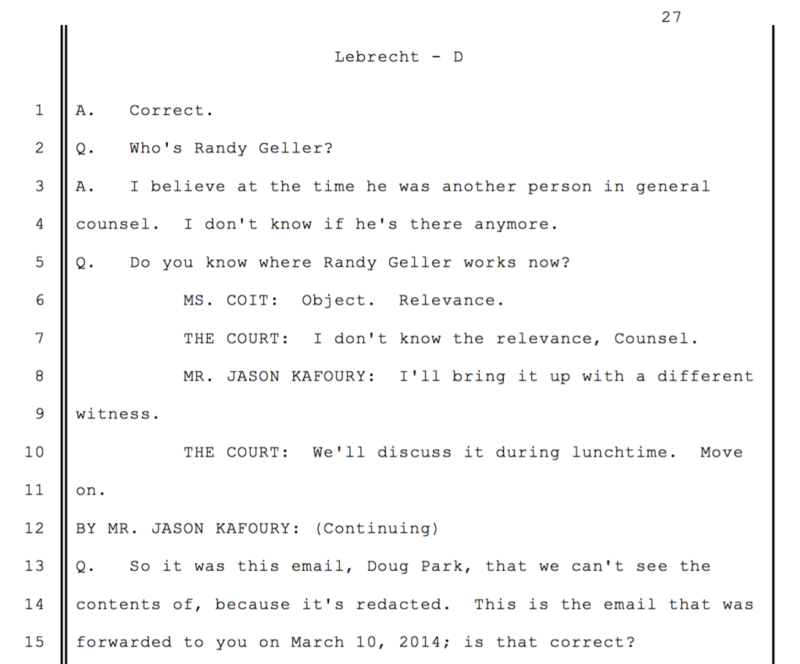 The US DOJ spent who knows how much money to bring in an out-of-state judge and run this trial. Not to mention the valuable time of 8 Jurors, for almost 2 weeks. 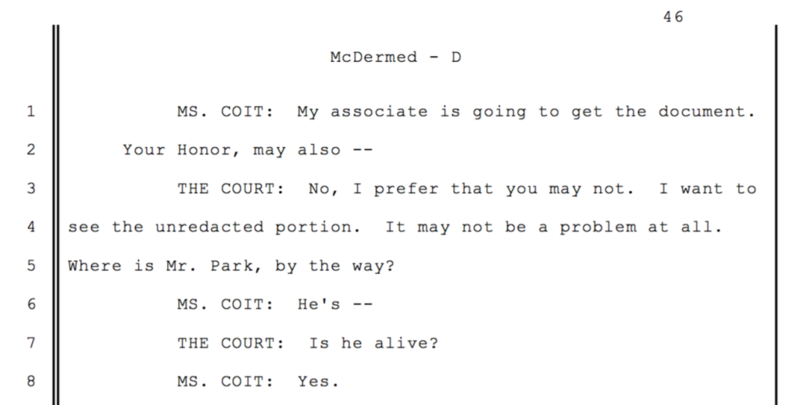 From what I can tell Judge Carter was on top of things every step of the way. 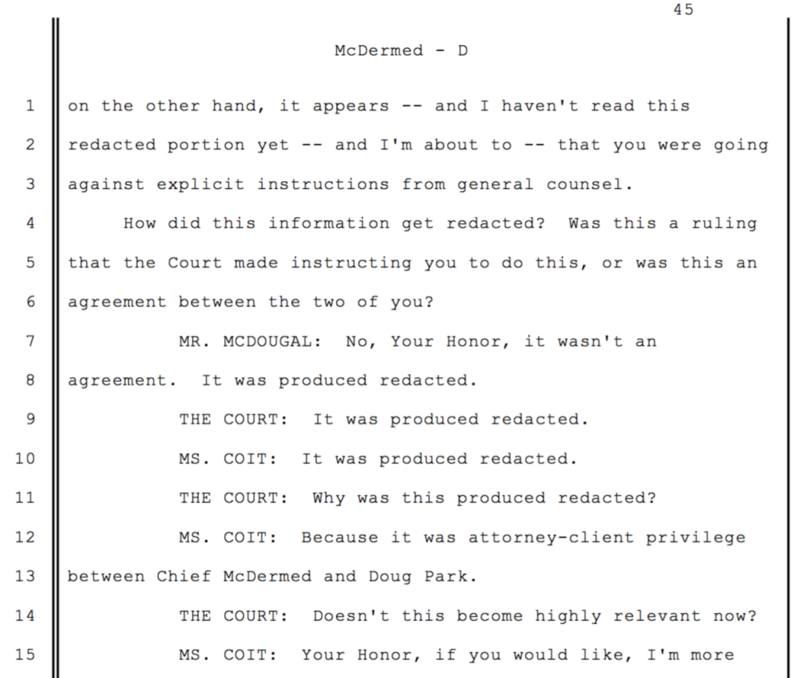 Coit agreed to the jury instructions. But she hears the jury’s verdict and *then* wants a do-over? That’s got to be a high bar. I guess it’s worth a shot when you bill by the hour though. Her full request is here, attachments here, and more on the jury instructions etc. in the (free but incomplete) docket here. Diane Dietz has an article in the RG here, with a link to a very interesting Atlantic piece here. Presumably Jamie Moffitt will be starting the searches to replace UO Chief Carolyn McDermed and other top officers soon, unless President Schill simply dissolves the UOPD and goes back to the more sensible and much cheaper public safety model, with police services contracted from the Eugene PD. After a rocky start 5-10 years ago, the EPD now seems to be doing quite well with its campus area party patrols, for example. Former UO VPFA Frances Dyke told the faculty – and State Senator Floyd Prozanski and the state legislature – that a sworn and armed UO Police Department would probably save money, compared to contracting with the Eugene PD. She lied. 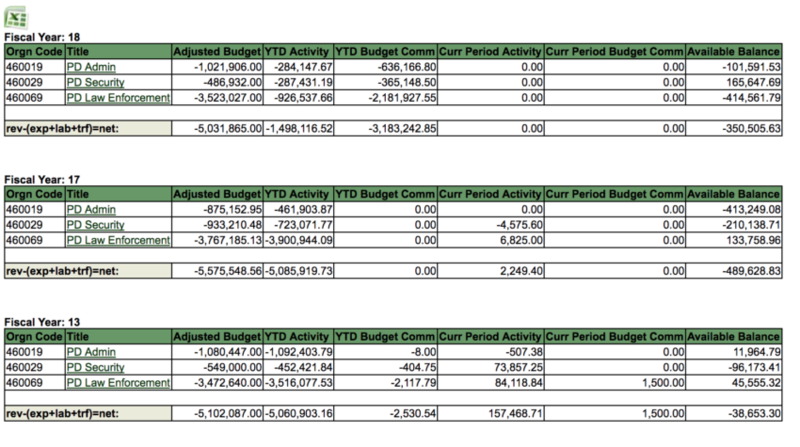 Actually it’s roughly doubled their budget, to $5.6M last year. 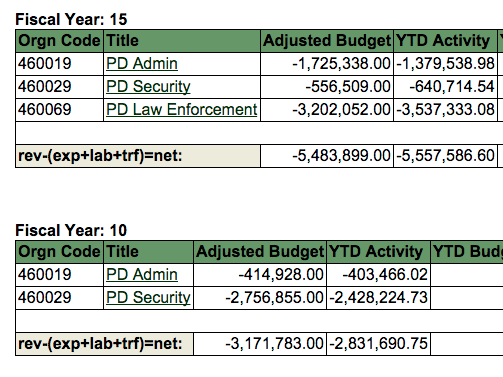 I’m not sure if the $2.7M increase over 5 years shown below includes the $500K plus that new VPFA Jamie Moffitt’s Budget Advisory Group – an attempt to bypass the Senate Budget Committee – gave the UOPD last year. The brand-new University of Oregon Police Department can expect high-profile incidents in which the campus police will use force — it is part of the job, and it is only a matter of time. 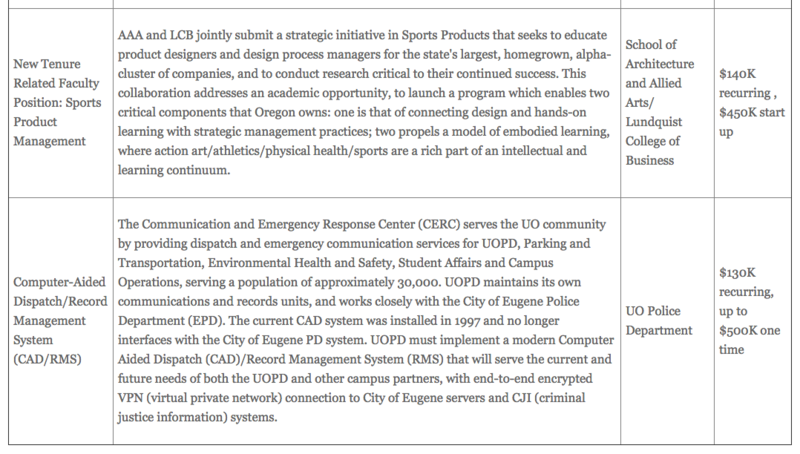 The UOPD doesn’t have an oversight system that meets the standards already voted on by the community. All too true. 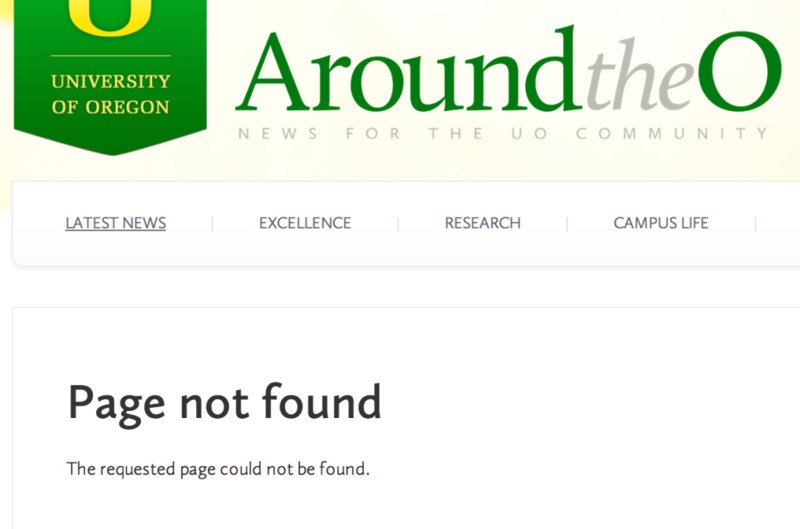 The conversion from a UO Public Safety Department to a sworn and armed UO Police Department has been botched in every way possible. Complaints that allege serious misconduct by a police officer or complaints that a department policy is unlawful will be forwarded to the vice president for finance and administration and the chair of the Complaint Resolution Committee. The complaint will be investigated by the department’s professional standards officer, and the result is provided to the Complaint Resolution Committee for review. Unlawful UOPD policies? How would you know? I’ve been trying for 4 months to get a copy of UOPD policies from Mr. McGiver.